These are the best made from the original Maeng Da kratom. 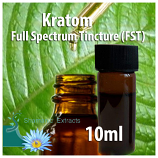 These tinctures are extracted through a highly advanced extraction process. The leaves of only the finest Maeng Da are extracted into this pure, powerful liquid. These tincture extracts have a full spectrum of alkaloids. Our laboratory is famous in kratom industry, and is committed to giving our customers the highest quality kratom at an affordable price.